Norman is a product design company based in Copenhagen. last friday saw the launch of their latest product, a very minimal toy plane. To celebrate this they threw a massive party in the car park of 'Magasin' (a danish equivalent of selfridges). 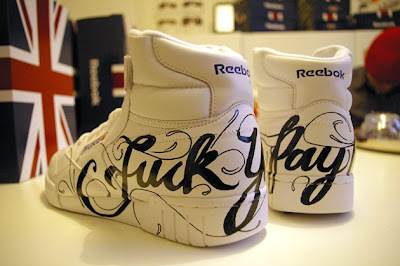 I was commissioned to paint some canvasses and customise some Reeboks for their VIP guests. My section from the Wall of canvasses, which will be auctioned off for charity.